Dim sum (點心) plays an important role in Chinese food culture and especially Cantonese cuisine. If you travel to Guangdong province or Hong Kong, you’ll often see people reading really thick newspapers, sitting in a dim sum restaurant with a pot of Chinese tea and plates of dim sum. Dim sum is a social food in Chinese cuisine, and is often eaten for breakfast or brunch. Generally dim sum is prepared as a small bite-sized portion of food and steamed in a small bamboo steamer, but there are also different kinds of dim sum prepared in different ways including deep-fried or baked. Spring rolls have their origins in the spring festival, and were originally filled with vegetables from the Spring harvest. The filling for these spring rolls includes barbecued pork and Chinese dried mushrooms (dried shiitake mushrooms,) along with shredded carrot, red bell pepper and mung bean sprouts. 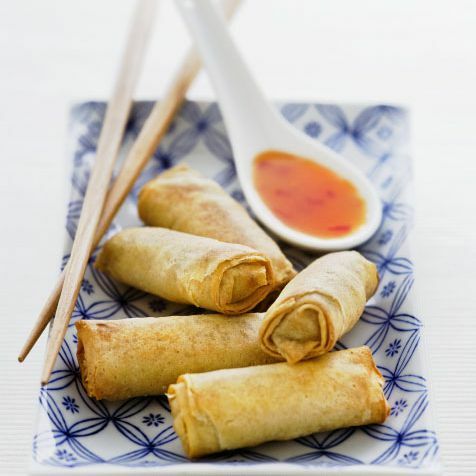 Serve the spring rolls plain, or with a simple soy sauce and rice vinegar dipping sauce. Vegetarians can enjoy vegetable spring rolls. You will find Char Siu Bao at any dim sum restaurant. Steamed buns are filled with barbecued pork, and the bun tastes slightly sweet with a very soft texture. These basket-shaped, open faced dumplings are also called “cook and sell dumplings.” This shu mai is filled with shrimp, pork and Shiitake mushrooms. Using wonton wrappers saves you from having to make your own dumpling dough. Seafood lovers can enjoy prawn and scallops shu mai. These steamed beef balls come from Evelyn Chau, who notes that the watercress absorbs the flavor of the seasoned beef. It includes dried citrus peel (chenpi), available at Chinese/Asian markets. Pearl Balls are made from sticky rice and delicious pork. The easiest type of Chinese dumpling to make, potstickers are fried on one side and then steamed. According to legend, potstickers were invented when a cook accidentally burnt a batch of dumplings and decided to serve them anyway. Ideally, potstickers should be crispy on the bottom and soft and smooth on the top. You can make vegetable potstickers, if you don't eat meat, and can freeze potstickers at home to save for later. Glutinous rice flour (sticky rice flour) is available in Chinese/Asian markets. Like other Chinese cakes, turnip cake is steamed instead of baked. Slices of the cake are fried just before serving. This mango pudding recipe is lactose free and comes with step-by-step photo instructions. Coconut buns (also known as cocktail buns) are filled with a buttery coconut filling, made with coconut flakes. Use up that flat cola in these delicious recipes.